Coaches from LFC Foundation visited Our Lady Star of the Sea Catholic Primary School in Seaforth this week to give their students a taster of the free and fun activities available in the borough of Sefton. 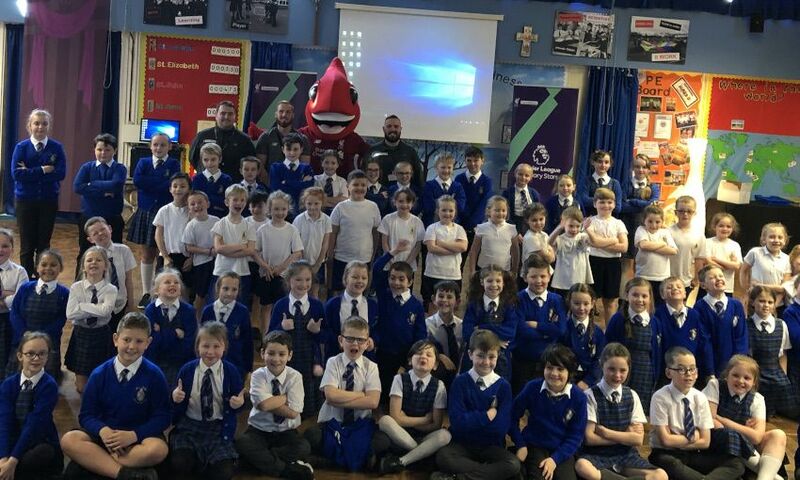 During the event, LFC Foundation project lead Dave McParland and the Reds' popular mascot Mighty Red hosted an interactive assembly to the children, about the importance of teamwork and keeping fit; while explaining the many ways that the children can keep active in their local community. Each week, LFC Foundation – the official charity of Liverpool Football Club - delivers Kicks football sessions at Netherton, and Open Goals family activity sessions in Seaforth and Crosby. Matt Ashton, Sefton Council’s director of public health, said: “We are absolutely delighted to be working alongside the Liverpool FC Foundation to deliver a wide range of projects designed to improve the health and wellbeing of schoolchildren across the borough. Kicks, funded by the Premier League, uses the power of football and sport to inspire young people in some of the most high-need areas in England and Wales. The LFC Foundation delivers 18 free Kicks football sessions every week throughout Merseyside, two of them take place at Netherton Activity Centre; 6-7pm for 8-11 year olds and 7-8pm for 12-19 year olds. Open Goals are the LFC Foundation's free weekly multi-sports and activity sessions in local parks; designed to support families to be more active together. The sessions, suitable for children aged 5+, are inclusive to all abilities and include a variety of activities like quick cricket, ultimate frisbee, orienteering games, and golf, to name a few. In Netherton, Open Goals sessions take place weekly after school: on Tuesday’s 5-6pm at Bowersdale Resource Centre in Seaforth, and Wednesday’s 4.30-5.30pm at the Alchemy Youth and Community Centre in Crosby. Kicks and Open Goals sessions are free, and require no prior sign up, so anyone interested can just turn up on the day. For more information about the LFC Foundations’ programmes and to download the Merseyside-wide timetables click here.